A handy size to have when a needle file is too small and a hardware store size is too big...and the attached handle makes them easy and comfortable to use. (Note: handle style may vary from photo). All files are approximately 7-1/2 inches long including the handle. 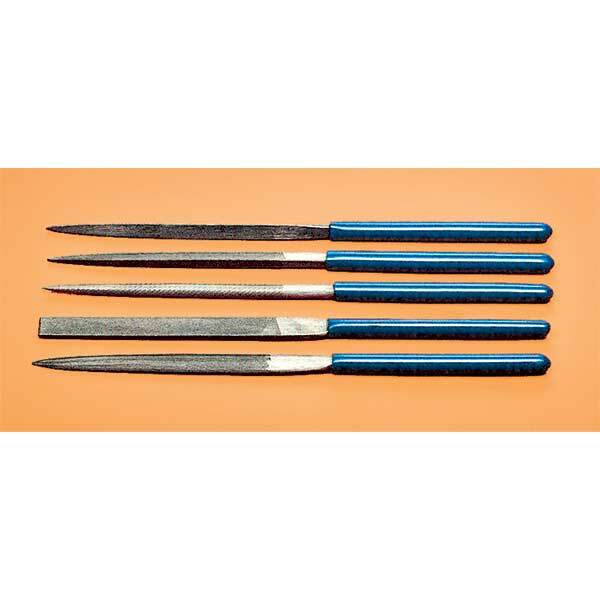 5-piece Mid-Size File Set includes: 3/8 inch flat, 1/4 inch three square (triangle), 3/16 inch square, 3/8 inch half round with taper and 3/16 inch round with taper. I highly recommend these files. Over the years they have served me well and I consider them to be an essential part of any modeler's tool set.